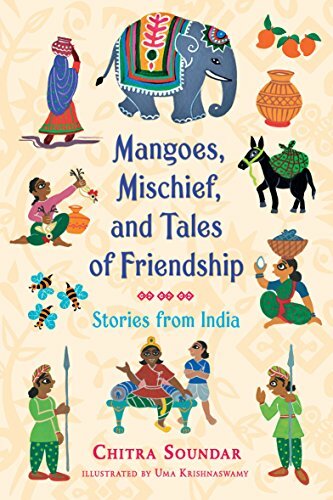 Mangoes, Mischief, and Tales of Friendship is a compilation of two previously published titles: A Dollop of Ghee and a Pot of Wisdom (2010) and A Jar of Pickles and a Pinch of Justice (2016). Based in a fictional kingdom in India, young Prince Veera and his best friend Suku, son of a local farmer, team up to evaluate and ensure fair behavior among the citizens. When King Bheema becomes indisposed he allows his observant ten-year-old son Veera along with wise and dependable Suku to hold court in his absence, trusting the prince not to tackle anything too serious. They are quickly faced with their first cases. The first two disputes regarding the proprietary rights of cow manure and the noisy air space around a singing neighbor are easily handled. Things get interesting when a baker wants to charge money to a person who only wants to enjoy the smell of his sweets and not buy them to eat. The decision they come up with is very clever (teaser intentional—no spoiler alert here). Instead of just issuing a decree and moving on, Prince Veera and Suku want to teach lessons in fair and equitable resolutions. The two are charming and innocent in their assessments and calculating and reasonable in their solutions. Encountering theft, greed, dishonesty, even the abuse of power from the royal household itself, Veera and Suku maintain their poise and integrity and display patience and good character through every situation. Part of the story’s interest is in the Indian folk tale premise that forms the foundation of the various neighborly squabbles. Earthy, practical scenarios introduce traditional foods, lifestyles, business practices and cultural mores. Setting and topic are intricately interlaced and balanced. The style of Krishnaswamy’s generous illustrations reinforces and enhances the Indian themes. Due to the solid storytelling, the cultural exposure feels sincere, authentic, and natural. It is easy to conclude that Soundar, originally from India, has found her sweet spot. Happy endings abound and some seem a bit too good to be true and too easily concluded, but the real crux is in the reveal of all the punchy plans Veera and Suku hash out together. They spend their days in solid good-natured friendship and demonstrate the value of cross-socio-economic relationships, which for India —and in the United States—is a dynamic that we can all learn from. Mangoes, Mischief, and Tales of Friendship is a well-rounded, satisfying, and readable collection.